The cut grade not to be confused with the “Shape of the Diamond” is crucial to diamond’s beauty and value. Of all of the 4Cs, it is the most complex and technically difficult to analyze. A good finish “Cut” grade testifies to the workmanship of the diamond polisher. • Scintillation: The amount of sparkle a diamond produces, and the pattern of light and dark areas caused by reflections within the diamond. 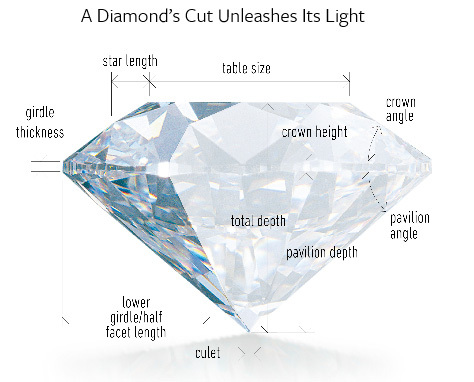 The cut grade calculates a range of parameters including the diamond’s proportions, culet size, girdle thickness, polish and symmetry descriptions and also takes into account the design and craftsmanship of the diamond, including its weight relative to its diameter, its girdle thickness (which affects its durability), the symmetry of its facet arrangement, and the quality of polish on those facets.